It’s a good time to be in the Aidy Bryant business. A longtime standout on Saturday Night Live, she’s also made time for the odd non-Saturday gig—a film here, a handful of Girls and Horace And Pete episodes there—but Shrill is a horse of a different color. Yes, she’s the star of Hulu’s acclaimed new series, loosely based on Lindy West’s book Shrill: Notes From A Loud Woman, but her involvement goes well beyond giving a terrific, often moving performance (which she certainly does). 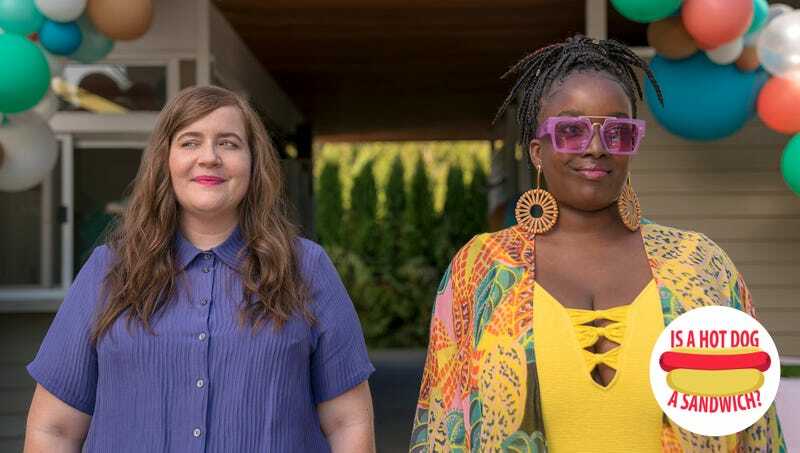 She’s also one of the show’s writers, and a producer—which means she was also pretty directly involved in finding the other actors who populate Shrill’s candy-colored version of Portland, Oregon. Enter Lolly Adefope. The British writer and comedian is having a hell of a year on our side of the pond, stealing scene after scene in the Steve Buscemi and Daniel Radcliffe-starring Miracle Workers and providing a sardonic, dreamboatish anchor for Bryant’s Annie as her loving but frank roommate and best friend, Fran. Shrill is good the whole way through—seriously, watch this show, it’s excellent and short, given that they had to make it in Bryant’s SNL offseason—but Bryant and Adefope’s scenes together are a consistent highlight. They’re great together. Bryant, producer, did Bryant, actor, a hell of a favor in helping to cast that role. They’re a dream team. So they answered this dumb question together. Aidy Bryant: No, I would say no. LA: Wait, a burger, is that a sandwich? LA: It’s an extension of a sandwich. I think a sandwich needs to be flat. And it needs to have variable fillings. Whereas a hot dog is [one filling]. LA: A burger is an exclusive sandwich. AB: A VIP beef sandwich. TO: So if a sandwich needs to have variable fillings to be a sandwich, is a Chicago dog a sandwich? AB: Yeah, probably? But at the same time, it’s not like you can get—I mean, I guess you can get a chicken dog or something, but to me, the frickin’ wiener is the thing. It’s like the anchor. That’s the hot dog only. LA: Just thinking about the shape! Hey Ken Marino, is a hot dog a sandwich? Hey Florence Pugh, is a hot dog a sandwich? Hey Susan Orlean, is a hot dog a sandwich?